Have a son or daughter that loves video games? Invite his or her friends to their birthday party with these single-sided video game themed party invitations! The cheerful video game controller themed design stands out among "normal" invitations. For convenience, corresponding gum seal envelopes are included. To seal simply wet the flap and stick. 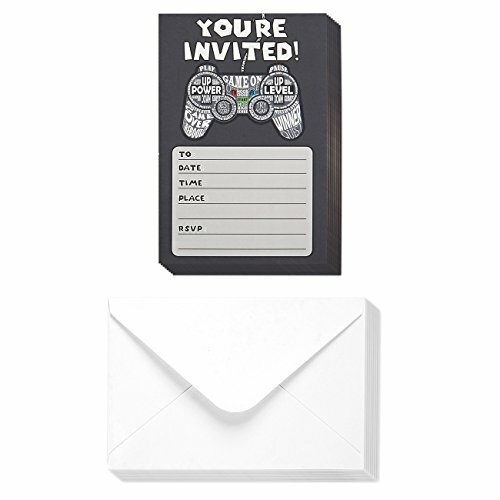 VIDEO GAME THEMED PARTY INVITATIONS: Includes 40 video game themed invitation postcards with ample space to fill in to, date, time, place and RSVP rows. VALUE PACK: Get 40 invitation postcards at a value price! Make sure to always have some on hand when you need them. INCLUDES ENVELOPES: 12 corresponding white gum flap seal envelopes are included. QUALITY: Made using high quality thick 300 gsm cardstock complete with a matte finish. DIMENSIONS: Measures 4 x 6 inches.